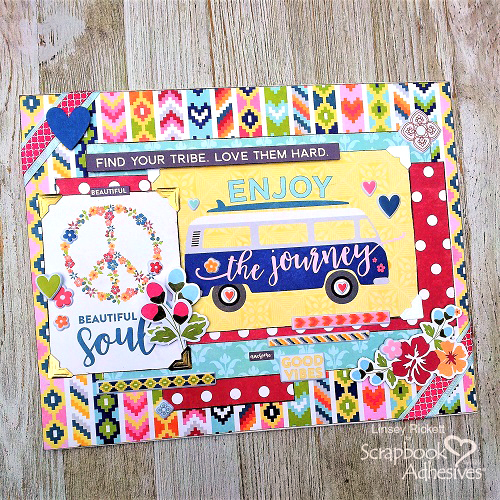 Take a look at this cool vibe going on the canvas project that Linsey Rickett created for Day 2 of our Blog Swap Week with Jillibean Soup. We are visiting both companies’ blogs and Instagram accounts for wonderful giveaways. 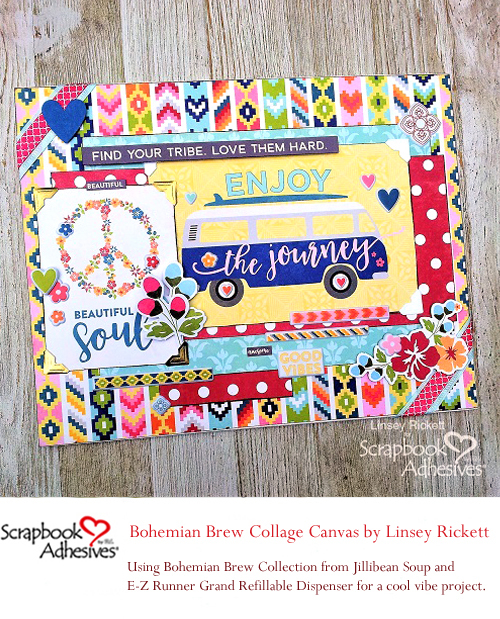 The designs from the Bohemian Brew Collection Pack inspired her to make this project with our E-Z Runner® Grand Refillable Dispenser and its various E-Z Runner® Grand Refills, and Creative Photo Corners. Don’t forget to read all the way to the end for giveaway details! 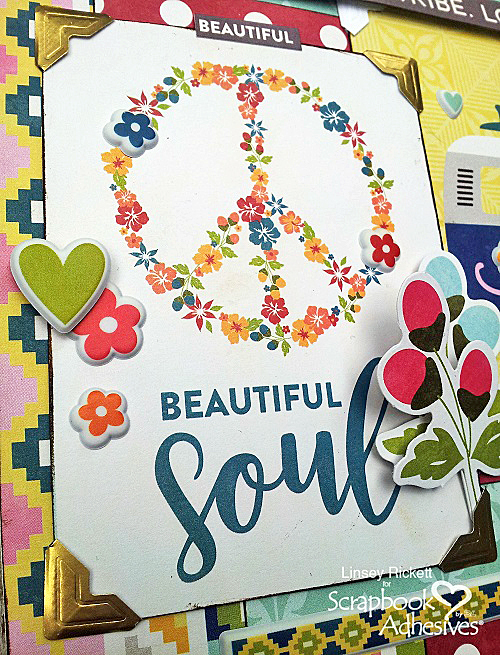 Using an 8.5 x 11″ canvas, I created a collage style with a cool vibe! I started with the 12 x 12″ sheet of Content patterned paper cut to size and adhered to the base of the canvas board with E-Z Runner® Grand Refillable Dispenser and E-Z Runner® Grand Ultra Strong Refill. Changing out the refill was a breeze! Check out the short video on How to Use and Refill E-Z Runner Grand Dispensers below. A piece of the blue patterned paper panel from Happiness was adhered down first and on top of it, a piece of the red patterned paper panel from the B side of Content was adhered down. This completes the layered base of the canvas. Now for the fun part, embellishing! 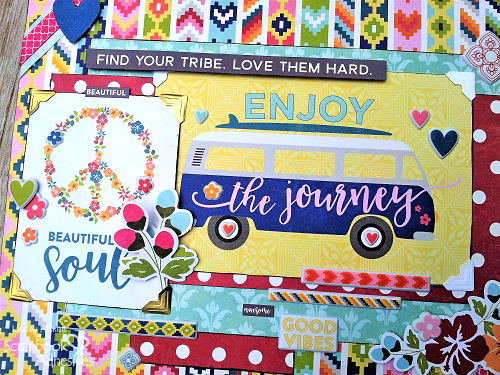 For the focal images (“Enjoy the Journey” and “Beautiful Soul”), Bohemian Brew Bite Size Bites was used by cutting the two panels and securing them with the Gold and White Corners from the Creative Photo Corners Mix Pack. A variety of Bohemian Brew Coordinating Stickers, Bohemian Brew Puffy Stickers, and Bohemian Brew Pea Pods were added to decorate the collage canvas. A few of the stickers were popped up using Premium Double-Sided Tape 1/4in for added dimension and a bit of ribbon wrapped around opposite corners of the canvas board using E-Z Runner® Grand Repositionable Dots Refill to finish. This repositionable adhesive is perfect for easy ribbon placement and is used with the E-Z Runner® Grand Refillable Dispenser. Did you miss out on the other Blog Swap + Giveaway Days? Check out Day 1, click: Color Full Week with Jillibean Soup! Here’s Day 3, visit: Notepad Gift-ables and Jillibean Soup. 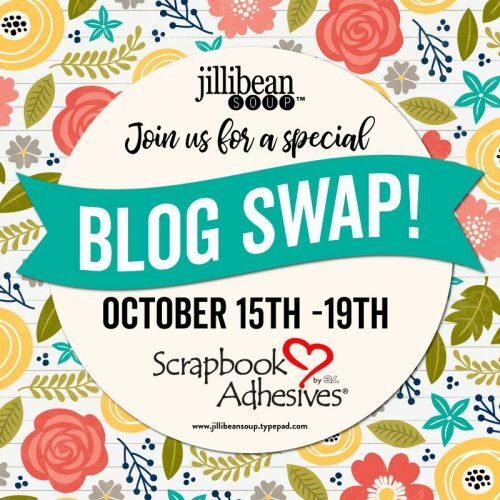 Blog Swap Week with Jillibean Soup Designs – Day 2. Winners will be randomly picked. International Entries are welcome. This entry was posted in Adhesives, Announcement, Beginner, Canvas, Crafts & Tutorials, Creative Photo Corners, E-Z Runner® Grand, Home Decor, HomeHobby by 3L, Permanent Adhesive, Repositionable Adhesive, Skill Level and tagged Blog Hop, Canvas, Creative Photo Corners Gold, Creative Photo Corners Mix Pack, Creative Photo Corners White, E-Z Runner Grand Dispenser, E-Z Runner Grand Permanent Strips Refill, E-Z Runner Grand Repositionable Dots Refill, E-Z Runner Grand Ultra Strong Refill, Giveaway, Home Decor, HomeHobby by 3L, Instagram, Jillibean Soup, Linsey Rickett, Premium Double-Sided Tape 1/4". Bookmark the permalink.